Rep: N as in Nancy? Rep: C as in cat? 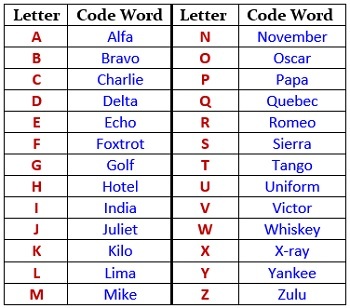 Yes, frustrated with clarifying each and every letter, I resorted to the NATO Phonetic Alphabet, believing it to be universally understood. Wrong again. You doubt me? How many of these code words have you used? So I wondered: where do call center reps and other civilians come up with their spelling alphabets? Is it random, as so often seems to be the case? It certainly isn’t informed by the military’s version, of which only the seldom-used Victor and X-ray appear. Now we see a pattern emerging. Most of the names, plus boy, seem to have translated into the non-public safety sphere, likely due to the abundance of cop shows and folks who have volunteered with firefighting units and rescue squads. 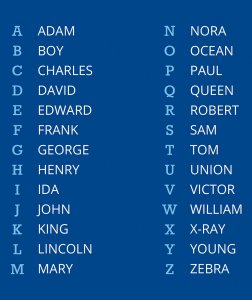 The LAPD alphabet, while not wholly universal, at least boasts the benefit of brevity: Nora is much shorter than November, Union beats Uniform, and, at least in the United States, Queen is more recognizable than Quebec (which must be pronounced KAY-BEC). But other problems persist: ball and Paul for B and P don’t work – they are too easily confused. The other problem is instant recognition. If one struggles to think of a code word for a letter, then that person will not decode code words quickly, leading to endless repeatings and correctings. That’s why I like having a standardized spelling alphabet at my fingertips. However, unless everyone understands your standard, the result is one big Charlie Foxtrot. This entry was posted in sightings, words on December 6, 2016 by mark.